World Congress on Electroporation 2015 :: Welcome! Organised by COST TD1104 Action – www.electroporation.net | Contact Us | Subscribe | Tell a friend | MyProfile | search! Intl. Fed. for Medical and Biological Eng. See the Special Issues page, links to the published issues can be found under the images illustrating the respective journals. More information is available here: Springer Reference Works - Handbook of Electroporation (or click the below banner). In the first issue of Radiology and Oncology in 2016, a section on the Biomedical Applications of Electroporation following the 1st World Congress is included. Access is available here: DeGruyter. 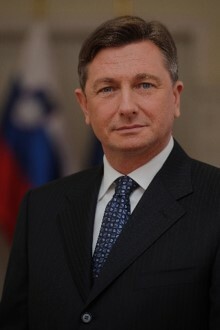 The 1st World Congress on Electroporation will be held under the Honorary Patronage of the President of the Republic of Slovenia Borut Pahor. 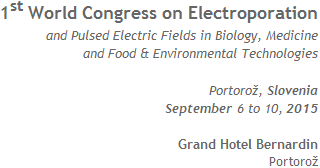 Welcome to the 1st World Congress on Electroporation and Pulsed Electric Fields in Biology, Medicine and Food & Environmental Technologies that is scheduled to take place in Portorož, Slovenia, during the week of September 6th to 10th, 2015. The meeting is organised with the intent of bringing together people from different disciplines possessing diverse expertise, who are involved in basic research or are developing applications based on electroporation and the use of pulsed electric fields of high intensity. The aim is to create an environment stimulating interdisciplinary interactions, to present latest achievements and demonstrate current knowledge. To this end, plenary sessions and poster sessions (with concomitant long coffee breaks) will be favoured. In addition, special sessions will be organized in parallel (up to 6 concurrent sessions) for the presentations linked to specific approaches or groups (e.g. BFE, Bioelectrics Consortium) participating in the WC2015. Meeting duration and organisation of a typical day: Four full days, Monday 7th to Thursday 10th. Sunday, September 6th registration desk opens in the evening, a get-together cocktail is planned. Rooms will be made available to accommodate any requests for satellite meetings (BFE, Bioelectrics Consortium, …), even if scheduled the day before or after the congress. Content is constantly being added to this site, so in case the information you are looking for is not available at the moment, please come back soon (or write to one of the contacts).